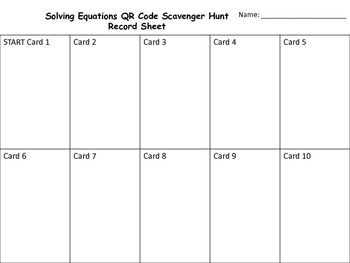 This fun scavenger hunt will get your students up and moving around the room using technology to practice solving two step equations. 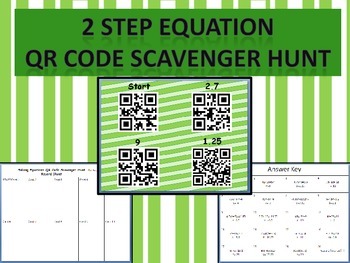 This scavenger hunt uses QR codes which are very engaging to students! 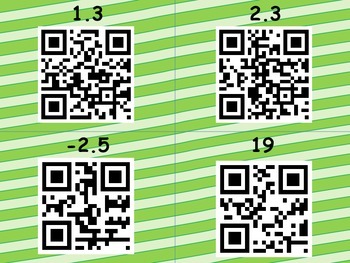 This activity requires students to use a mobile device with a QR code reader such as a tablet, iPad, iPhone, etc. Students scan the start card to get the first problem and then look for the card with the answer they got to scan for the next problem. The problems are all on solving 2 step equations and meet common core standards for seventh grade. This is also a great review of solving equations for eight grade students and beyond. 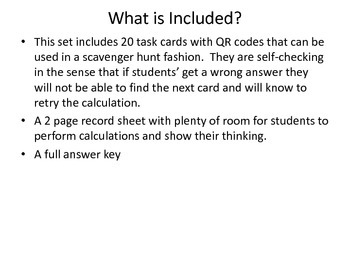 The set includes 20 scavenger hunt task cards, a student record sheet, and a full answer key.